Colorful Abstracts Wall Calendar or Desk Calendar! 2016 ~ "Colorful Abstracts" WALL CALENDAR ~ Sold Out! This calendar makes a powerful gift for yourself and for all the color lovers on your holiday gift list! 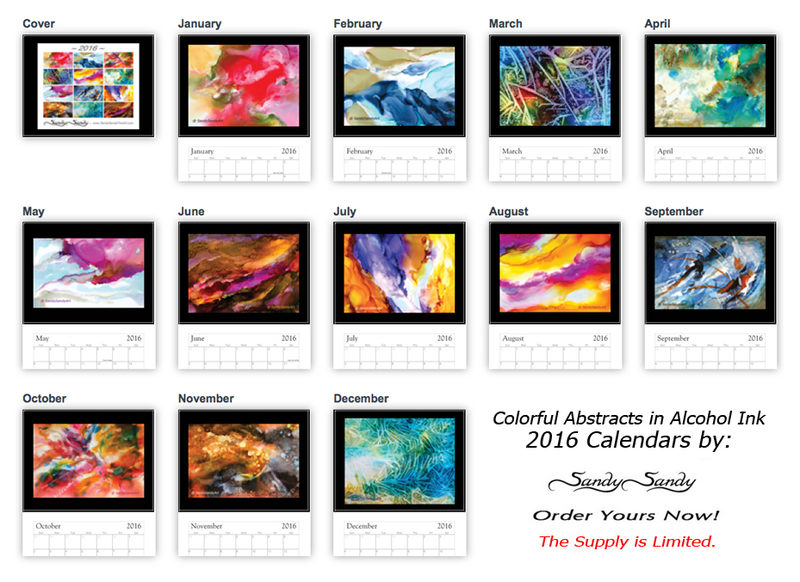 so purchase your "Colorful Abstracts in Alcohol Inks" 2016 Calendars today! $19.99 ea., 2 for $17.49 ea., 3 or more for $14.99.ea. Avoid shipping costs and take advantage of all the studio specials! 2015 Calendars Sold Out ~ Thank you! for easy jotting and features 12 abstract paintings by Sandy that are suitable for framing. These vibrant paintings were all done in the new, exciting medium of alcohol ink! !